Hello to you! Hope your week is going well. Are you all prepared for Christmas next week? Me…not so much. I still have a few gifts to buy and I haven’t wrapped one single thing yet. Oh, and then there’s the Christmas cards. Ugh. In the midst of all my preparations, I’ve been eating a lot. So much so, that I went and joined the YMCA this week. I want to eat whatever my little heart desires, in moderation of course, so I’m going to have to ramp up the exercise to make up for it. One of the things I’ve been enjoying a little too much of is cookies. I made one of my favorites last weekend, Peanut Butter Blossoms. Mmmm, chocolate and peanut butter…a delicious combination. And what’s the perfect pairing for a sweet and tasty cookie? Well, okay, I’m sure some of you are saying coffee, but since I don’t drink that, how about hot chocolate, especially in these super cute cups? I found them at Garnet Hill and it was pretty much love at first sight. They’re basically a big bowl with a handle. Preheat oven to 375 degrees. Blend butter, shortening and peanut butter together in a large bowl. Add the sugars and continue to beat until it’s nice and creamy. Add vanilla, milk and egg and continue to mix. Then add the salt, baking soda and flour. Roll dough into balls of about 1 inch in size and then roll each ball in some sugar. Place on an ungreased cookie sheet. Bake for approximately 10 minutes. Immediately after removing from the oven press one candy kiss into the center of each cookie. Well, I have lots to do, so hope you all have a great weekend! Those are the perfect cups for christmas! Your photos are always so amazing. Someday I will own a fancy canon…but I think I will always love my canon pocket power shot in turqoise. I've never heard of these cookies being called 'blossoms'…Oh how I love that. Merry Christmas! Tricia!! your photos are so beautiful i know you hear that over and over- but i can’t help it : i love coming here just to get my daily dose of beauty. FABULOUS!!! Your photography continues to amaze me! I've been given a 50mm prime lens but it doesn't autofocus with my camera so I'm playing and adjusting and learning. For Christmas the Hubs is getting me a 35mm prime lens that does autofocus. When I grow up I want to be able to shoot amazing photos like you! 🙂 I'm pinning! Oh and those cups…sigh! The cup is so pretty.Love the photos. Such a delicious , cheerful , kinda happy , jolly post … I love these ckookies and the cups are fabulous ( for invigorating the Christmas spirit ) …Thank you for the perfect photos ! Enjoy ! LOVE your pictures and your blog! Oh my dearest Tricia! You don't know how much I really enjoy your posts!!! 🙂 I know that whenever I click on your link on my blog sidebar, it will not disappoint! 🙂 Your pics and recipes are just yummy to say the very least! 🙂 And you know what, I too have been eating waaay TOO MUCH for the holidays – I can tell because my jeans are fitting a little too tight around the waist as of late! lol So like you, I've decided to join a local gym BEFORE the New Year's to help out with this extra weight! lol But I really don't care for now, because I really want to enjoy the holiday season before it's over all too fast! Hugs & Happy Holidays to you!!! I love those red and white cups. Stunning pictures indeed. Love it all! Ummm thanks for those gorgeous, low fat, tempting cookies!! I think I will make these!! I adore that coffee mug! Absolutely wonderful! Love your blog! Your cafe au Lait cups are so cute. Your cookies look so good that I could take a bite! Love the cups and the cookies look so yummy too! Have a good day..
Ahhh such sweet cups, I would fall instantly in love with them too. And those cookies…yummalicious!! Enjoy these final days of Christmastime!! What beautiful cookies and the festive cups are so gorgeous. I love the cups! And the cookies and kisses scream "Christmas!" my husband's favorite cookies! these photos have just inspired to bake. I dislike cooking so much, but you make it all look so pretty! Thanks for the inspiration!! Mmmmmm, I make and love those cookies, too. But they've never looked as pretty as yours! Tricia, I used to make those cookies each year when the kids were kids at home. I do love them. Know what you mean about the goodies and the body. My oh my do I need to do something. I do wish you would do some photography how to posts some time. I want to know what settings you use to get these shots. What's better than a pb cookie? 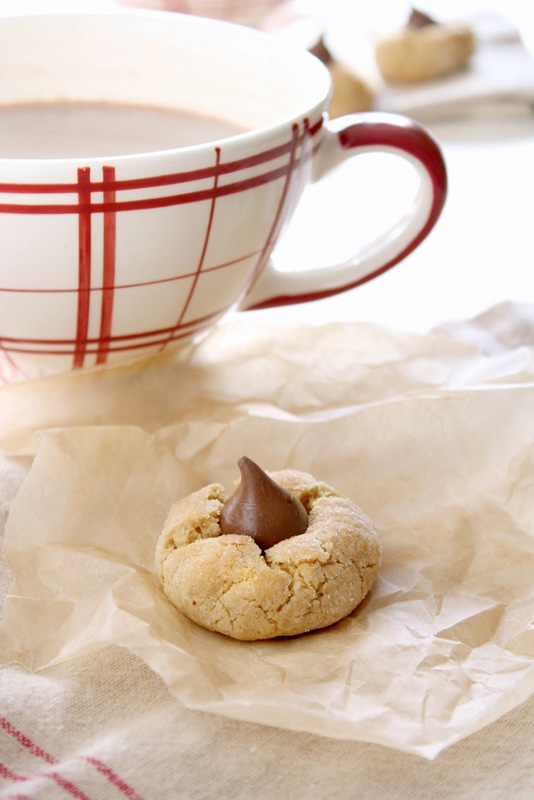 A pb cookie with a hershey kiss on top! Yum! Great pictures – I really love your cup it is so pretty and those cookies look wonderful. I just made those cookies at my daughter's house and neglected to bring any home. Oh well, I'll just have to make another batch for me. Those red & white cups are so fun! Have no fear…you are in good company. I'm not finished shopping yet and haven't wrapped a thing!!! Beautiful pictures!! Your cookies look so yummy, and I love your cups. These are one of my favorites, and can't wait til I have some time next week to make them. Your photos are beautiful!! Yummmy! Yummy! I haven't made them in years. Where a peanut butter ball family here instead. Funny that you don't drink coffee. Me either, I like the idea of it, just not the taste – ugh! Those cups are amazing, I want those for Christmas! – and some of those cookies as well! Nothing quite so perfect as chocolate and peanut butter!! I am pretty much all set for Christmas, except for the wrapping, also. Hopefully I'll get to it soon! These are beautiful photographs Tricia. oh, those cups are just so adorable and the cookies are one of my faves! your photography is stunning, I'm a new follower here…thank you for the lovely inspiration! What a pretty cup and perfect for warm beverages at holiday time. Another round of beautiful photos. So pretty. WOW.. delicious looks so beautiful and yummy!!!! These are my youngest's favorite….what's not to love about peanut butter and chocolate! Your photos are just picture perfect. It's such a treat visiting you Tricia! I love your e-zine with it's very professional photos. I just wish you got paid big bucks for it too! haha. But you do spread a lot of joy. I love your new kitties. Hi! I am visiting from Feathered Nest Friday. I saw your cup and just had to stop by. I just ordered a set of thise cups from Through The Country Door. I LOVE them. My set actually came with few different patterns. My Mom always made Peanut butter blossoms for Christmas when I was a kid and now I make them with my daughter. It wouldn't be Christmas without them! These cookies look delicious…I make blossoms with shortbread…lots of buttah!! I wish we lived closer, I'd go to the Y with you! Then we could bake to our hearts content! Love the pretty cups…I rarely make it past the first few pages of Garnet Hill before I start looking at the clothes and feeling like I'll never look as good as those pretty ladies do! lol! Don't feel bad about getting things done a little late. Bake and do the fun things! The rest will come along, that's the excitement of Christmas! 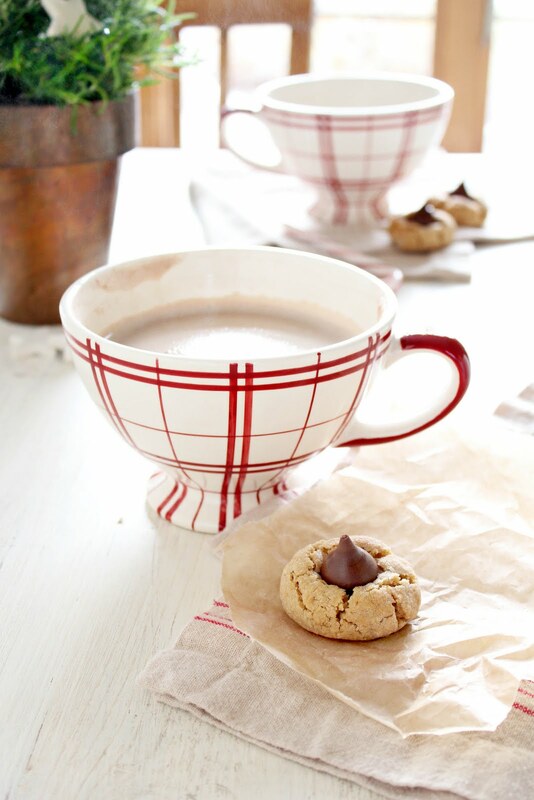 I'm positively in love with the red and white cups… Those cookies don't look too shabby either! The cookies look delicious. Those are a fav in our home also. Love the cups too. It's always fun to drink coffee from a fun or pretty cup. Boy do those look good.. I think I just gained 5lb just looking at them.. Your photos are so gorgeous.. They always have such a homey feel. I love that! My all time favorite xmas cookie! Gorgeous photos too! I love those cookies! I think I'm vetoing the normal traditional "Santa Cookies" we usually make and going with these this year 🙂 Your decor and pictures are lovely! the composition is extremely stunning! i love how creative you are. those cups are the perfect ones for xmas! That looks soooo yummy. Love the cups! Tricia I am loving those Cafe au Lait mugs! Coffee cups are one of my favorite things. When I find new ones I am slightly giddy. And I cannot wait to try that recipe – something the kids will love over the Holidays I am sure. Like many of the ladies who commented, I am just here to get my daily dose of inspiration and look at the beautiful photography! My day is always better when I visit you. Oh we have alot in common..cookies, cups, hot chocolate..all dee-lish!! Love the way you portray all these goodies! You sweet girl..thanks for this yummy recipe! I think I gained 5 pounds just looking at your photos, Tricia. lol! I've been obsessing over cafe au lait cups lately, too….for some odd reason. (Still trying to figure that one out. hehehe!) Hugs to you, sweetie! Your photos are absolute perfection, Tricia! And now I am dying for one of those cookies! I could just gaze at all these beautiful images for hours. I love how you compose them…and those cookies look scrumptious! What a lovely post and the photos are gorgeous!! I love those cups!! I'm in love with these photos! The cups are lovely and the cookies look so good. I want to try them. And I always test my cookies to make sure they're good! Thanks for linking up with this or that Thursday! Beautiful yummy set! I love that way you lit these! You know I am a huge fan of backlighting. I would totally put those mugs in my cart if I saw them at a store – they are fabulous! Happy weekend Happy Holidays! These are one of my fave all time cookies anytime of the year. Dearest sweet tricia, i LOVE yoru gorgeous cups so much!! I want one too. 🙂 These cookies look so yummie. Thanks so much for sharing the recipe with us! Have a beautiful sunday sweet friend. 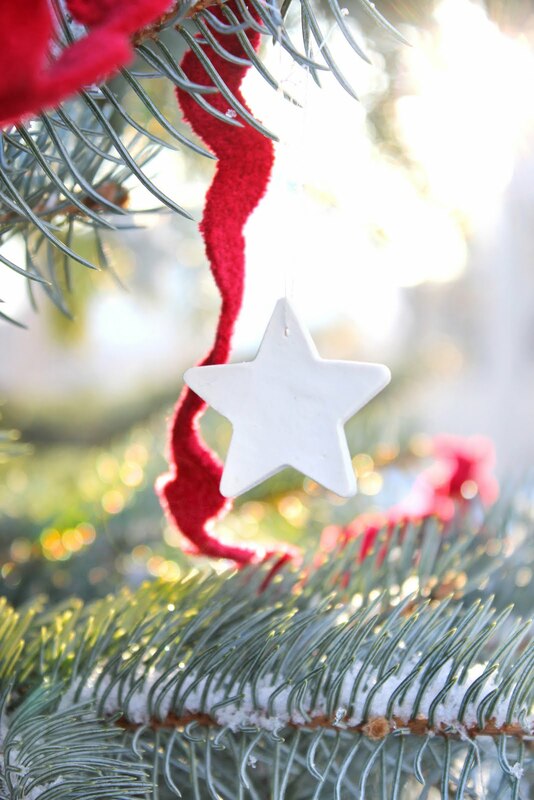 Wishing you a wonderful festive time with your friends and family!! Love to you! I love these cookies. Your photos have made my mouth water. It's warm here for our Christmas, but that doesn't stop me having a yummy hot chocolate. It is hard not to over do it during the holidays! 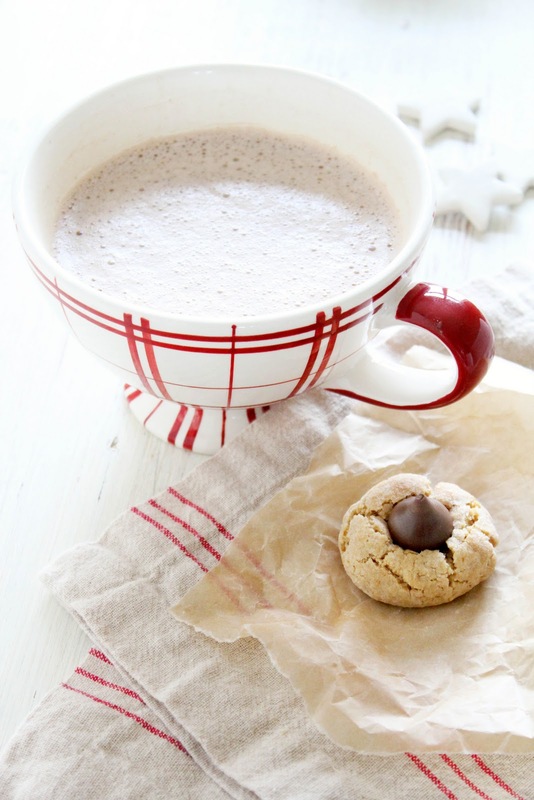 Your cookies and Cafe au lait look delicious! Marvelous pictures! Lovely to be here, Tricia. Your photos are amazing and sweet and technically splendid – all at the same time! Coffe or hot chocolate, all goes well with those yummy cookies. And the cups are very fun. Love the images. I love those red and white cups. It's always nice to drink coffee or tea or hot chocolate from a pretty cup like yours. OMWord Girl!Hahaaa….This all looks so Good! My hubby likes to bake cookies, so much so that I think I'm going to turn into one! Merry Christmas friend…Your photos are SO beautiful! Hi Tricia! How are you? Happy Holidays to you and your family! Oh, what a yummy post! Your photos looks so beautiful! I hope I get the chance to make some. I'm off to catch up on the rest of your blog! This post is just delicious looking, Tricia! Love your wonderful cups…and the cookies and hot chocolate…well I'll just say eating half a dozen would be no problem lol! What a treat to have the cafe au lait and a cookie! Your photos look amazing, as always. I love your cups. 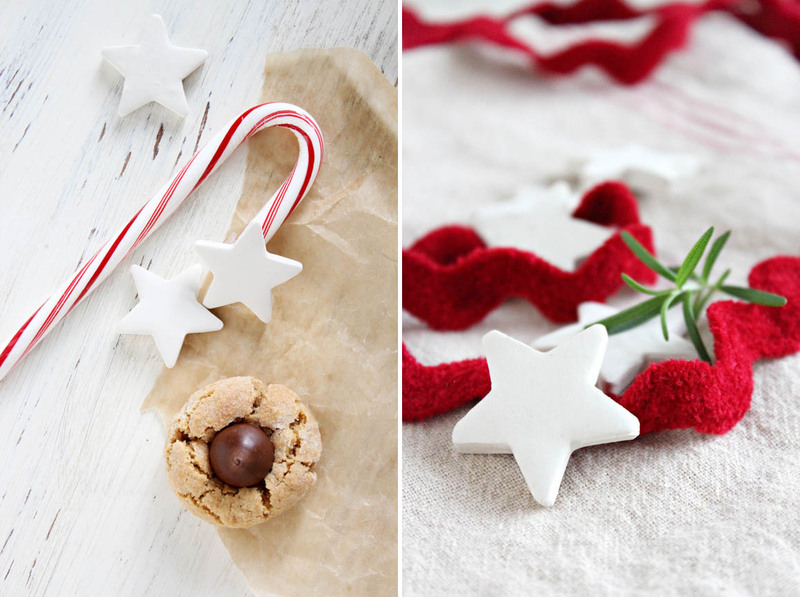 They are so festive and perfect for hot chocolate…you are a girl after my own heart. The cookies look delicious! I have been indulging a little too much in the cookie jar too. Oh well, it's Christmas and it's time to be festive and celebrate. I wish you and your family a very, very Merry Christmas and all the joys of the season. Tricia, I wish you, your family and all visitors to your blog a Merry Christmas. Take this opportunity to announce that January 02 Urbanascidades debut in 2012, the same … but different. SO gorgeous Tricia~ I love your beautiful photos and yum on the cookies!! I agree- peanut butter and chocolate- YUMMM YUMMM YUMMM!!! Merry Christmas to you and yours and thanks for sharing at FNF!